On Saturday, when American radio show host John Batchelor inteviewed Filligent co-founder and CEO Melissa Mowbray-d'Arbela about her company's BioMask™, he spelled out the word "Filligent" for his audience. And at the end of the interview he told the audience to "Google BioMask" for more information about the mask. Here we come to a snag -- or, in the immortal words of Dorothy Parker (and Jay Currie), "One damn thing leads to another." If you google "BioMask," "biomask," or "Biomask" you'll see, near the top of the first Web page under "Images" for the BioMask™, a photograph of a man wearing a bio-chemical warfare/accident mask. That is not the BioMask™. Yet to the left of the man's image are two photographs of genuine BioMask™ packages. And to his right is a diagram of the genuine BioMask™ construction. In other words, the unwary could easily assume that the bio-chem mask is the BioMask™. This is most unfortunate because no one in his right mind would wear the bio-chem mask unless he was trying to survive a bio-chem incident or scare the hell out of someone. I am not a Google wizard so I have no idea how to fix this problem and after searching unsuccessfully for an email address where I could send my complaint to Google, I gave up the idea of asking Google for help. If anyone knows how to fix the problem; i.e., get the photograph of the bio-chem mask removed from the line-up of BioMask™ products and substitute a photograph of a genuine BioMask™ (note the name is trademarked) at the BioMask, Biomask, and biomask Google Web pages, please fix it. There is possibly a workaround to the problem: this morning I noticed that my post of yesterday about the BioMask™ has appeared near the top of the second page of Google's Web page for "BioMask." The accompanying photograph, the same as the one above, does show the BioMask™. So if you wouldn't mind, could you visit the second Google Web page (links provided above) and click on the link to my post that has the BioMask™ photo attached? Perhaps if enough people do this, it will move the link to my post and the accompanying photograph of the BioMask™ onto the first Google Web page. And, I hope, even move the photograph right underneath or above the one of the gentleman wearing the bio-chem mask. If this works, at least Google readers can see at a glance what the real BioMask™ looks like, and not assume they have to frighten the living daylights out of people to be suitably masked against a flu bug. This not to say I don't think the well-prepared person shouldn't have a bio-chem mask handy. But right now we are in the midst of a pandemic and for that I think the BioMask™ is the best facial mask for protection against the 2009 swine flu. And, as you can see, the mask is the most attractive one available for the purpose. It's also the most 'breathable' and comfortable. It can be worn all day and even during heavy exercise. It's also easy to put on; it has adjustable ear loops and a double curved shape that expands to fit closely to most faces. It comes in two sizes so it can fit not only an adult face but also a child's. The mask is also safety-certified and non-irritating to skin. In 2008, Filligent developed a revolutionary technology which traps & kills viruses and bacteria on contact. This molecular technology can be applied to substrates such as rayon and cotton textile fibre. BioFriend™ captures microbes by mimicking the sites on human cells to which they normally attach, then, destroys them by disrupting their surfaces (viruses) and cell walls (bacteria). BioFriend™ kills the full universe of germs including those that cause Influenza A, Bird Flu, common colds, measles, pneumonia, SARS, tuberculosis, and MRSA. By targeting only the dangerous elements, BioFriend’s intelligent filtration technology optimizes breathability and comfort. With BioFriend's ability to kill a broad range of microbes, while applied to various substrates, the technology naturally lends itself to wide application across consumer products. Not only does BioFriend™ contain and protect against infection, but it also keeps items of everyday personal use, prone to bacterial and viral contamination, safe and clean. Check out Filligent's products page for information about other anti-pathogenic items they sell. And give a listen to John Batchelor's interview with Melissa Mowbray-d'Arbela. The podcast is at this link, July 25, Hour 2, the second interview. RBO blog's Swine Flu Reader has links to all my posts on swine flu since April, and which have been crossposted there with illustrations provided by RBO. Filligent co-founder and CEO Melissa Mowbray-d'Arbela's interview with John Batchelor was great. The podcast for the interview (Saturday, July 26, 10:20 PM ET) will be posted at John's website sometime today. She told John that the BioMask™ (at right) is available for sale in every country but the USA. She also said that Filligent is waiting on FDA approval before the BioMask can be sold in the USA. Over the weekend Freedom Fairy sent me a link to an online medical supply company that will start selling the BioMask on September 1st. You can probably put in an order now. I didn't check to see if they're selling other Filligent products made from the same BioFriend™ material as the BioMask. I did note that the site takes all major credit cards. The mask and other BioFriend products, including the fabulous BioFriend pathogen-zapping dry hand cloth (the "QuickCloth") and the BioFriend QuickPatch, are being sold at Filligent Europe, which accepts payments via Pay Pal. Freedom Fairy said there are several other online medical supply outlets that are selling the mask or will be, and which can be found through a search engine. Regarding the patches, I'd originally thought of slapping them on kids' clothes so they could just wipe their hand across the patch to remove viruses and bacteria. But another use would be to stick the patches on your desk at work and right outside the office lunchroom. I don't know how big the patches are but you could always stick a few together to make a larger surface. People could wipe their hands on the patch before they entered the lunchroom. The patches might not last as long with several people using them (the QuickCloth is good for a month of personal use) but heck, they're not expensive and even if they have to be changed every day outside the lunchroom it'd be worth it during a pandemic. Many people won't take the time to properly wash their hands even if they're inclined to wash them. If you only wash for 10 seconds, you might as well not wash at all if your purpose is to neutralize pathogens. So the more I think about the patches the more places I can think to stick them. And I am not sure how long it takes alcohol-based gel sanitizers to work. I can't find the link but recently I read that alcohol has to be on a surface a few minutes to sanitize it. Don't quote me on that but if it's true, and the sanitizer you've used hasn't worked by the time you touch your eyes, nose, or mouth or any surface, that's defeating the purpose if you're carrying a virus. 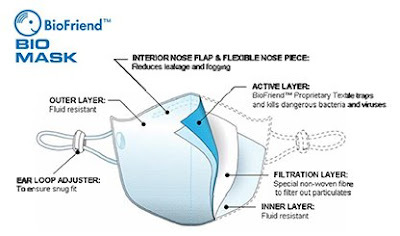 The BioFriend technology used in the masks, cloths, etc. kills bacteria and viruses virtually instantly. Carbon tariff proposal: That's the ticket! Start a global trade war during a pandemic and deep global recession! The issue of greenhouse tariffs has met bitter opposition from developing countries such as China and India, who count on the developed world to buy their exports as they build their economies in the face of the worst financial crisis in decades. Matthias Machnig, Germany's State Secretary for the Environment, told a news briefing on Friday that a French push for Europe to impose carbon tariffs on imports from countries that flout rules on carbon emissions would send the wrong signal to the international community. "There are two problems -- the WTO (World Trade Organization), and the signal would be that this is a new form of eco-imperialism," Machnig said. "We are closing our markets for their products, and I don't think this is a very helpful signal for the international negotiations." European environment and energy ministers are meeting in Sweden to try to come up with a single vision of how the 27-member bloc will fight global warming, ahead of a major environment summit in Copenhagen. The first phase of the 1997 Kyoto Protocol on cutting greenhouse gas emissions is set to expire in 2012. Final negotiations on a successor climate change pact will take place in the Danish capital at the end of the year. The U.S. House of Representatives has already passed legislation that contains carbon tariffs. It would allow the United States to impose duties on imports of carbon-intensive goods such as steel, cement, paper and glass from countries that have not taken steps to reduce their own emissions. Some say such tariffs could be a backup plan for Europe, should United Nations members fail to reach a deal in Copenhagen. But Swedish Environment Minister Andreas Carlgren, whose country holds the rotating European Union presidency, said member states currently had no "plan B" beyond landing a deal in Copenhagen. He said there was as yet no official proposal on the table from the French regarding carbon tariffs. "We are absolutely against each try to make use of green protectionism," Carlgren told Reuters. "There should be no threat of borders, of walls or barriers for imports from developing countries." French President Nicolas Sarkozy's office said last month such taxes could help create a "level playing field" for European companies competing with international firms from countries that have not put a price on carbon emissions. EU Energy Commissioner Andris Piebalgs has said member states should keep the French proposal in mind, but also worries how such tariffs could be viewed by other countries. China said earlier this month carbon tariffs would violate the rules of the WTO and the spirit of the Kyoto Protocol. Such tariffs would represent a radical shift for the WTO, whose goal is reducing barriers to trade. However, the WTO says it is possible to impose import tariffs if such taxes are also imposed on a country's own industry to ensure a level playing field. However, Europe could see some progress on domestic carbon taxes on a national level within the 27-member bloc. Sweden's finance minister, Anders Borg, plans to raise the issue at the next finance ministers' meeting, Industry Minister Maud Olofsson told a press briefing. Having boarded a flight in Manchester, UK, yesterday morning, I took one of the offered newspapers. There was ONE mention of swine flu in this Thursday evening paper: on the sports page. A local football (soccer) team's coach was voicing concerns about what swine flu could do to his team if several members became infected. This was Manchester, after all, not London. The London papers continually had front page scare stories about swine flu each day for the week my wife and I spent in Lancashire. BBC had daily long interviews and panels on swine flu. On Thursday evening in an airport hotel we could see SkyNews and Granada TV in addition to BBC. They were all talking swine flu. A bookshop clerk in Lancaster was asked on Monday about concerns about swine flu? "None," she replied, and she went on to say, "It's all about a coverup." Of what? "The economy." She had spent the weekend in London and says it was business as usual to her eyes and she was amused by several young Asian men wearing masks. "They were students just off the plane, no doubt." It would be fair to say that the UK epidemic of swine flu slowed last week, because the schools ended there term for summer holiday. By the end of the week, some commentators were reporting that locales with huge increases in caseloads the week earlier were now showing lesser growth, while some newer areas were accelerating in cases. The Brown government is blamed for both hyping the swine flu story and doing too little about it. There has been mass confusion. Government politicians like Sir Liam Donaldson have reversed positions sporadically and people in general are feeling let down by the NHS. The newest UK plan is to offer Tamiflu packages at a nearby pharmacy to anyone who calls the national "hotline" and passes the verbal test of symptoms. "Experts" set up the dichotomous key that begins with "Do you have high fever?" Unfortunately, I could not find the definition of high fever. Presumably, all Brits know exactly what that means. The call center personnel were folks out of work who had received a six hour training session. As it opened on Thursday, the website was jammed by hits and the call center had immediate busy signals. One enterprising person at SkyNews called with carefully predetermined symptoms of strep throat and was offered Tamiflu at a local pharmacy. One other horror story was of a teenage girl given Tamiflu for 5 days with no improvement and her family took her to the Accident and Emergency Ward where she was hospitalized with meningitis. The London newspapers were now carrying a story about the millions paid to one UK vaccine manufacturer of swine flu vaccine. That company had shown a profit for the current quarter while they had received the government millions for the swine flu vaccine doses which they are in the process of producing. As a physician, I can understand that free Tamiflu and an excited populace had overwhelmed the nation's GPs. Early last week they were reeling from phone calls and emails from patients. Many simply wanted to have a supply of Tamiflu on hand, in case they became ill.
No one knows with real certainty why there is a surge of influenza in the colder months of the year. One study suggests the virus is more infective when the nose breathes in colder air. They have some data to 'prove' that theory but I remain a sceptic. The UK experience in the London vicinity schools -- which were rarely closed with large cases of flu and where case rates fell off the week after schools closed -- seems instructive. Two stories about UK school groups traveling to foreign countries made the local news during the week: in China the group was quarantined for a week when two children had symptoms of flu on arrival and in the second case a group traveling to France was sent home with masks on their faces, amid taunts by French people seeing them in the airport. It didn't do much positively for Anglo-French relations, but that has never bothered the French. Is there a Gatesgate connected with Obama pal Professor Henry Gates? We interrupt this blog on swine flu to bring you breaking news, or at least breaking observations, by sharp-eyed Dan Riehl at Riehl World View. Melissa (picture below) needs no introduction to readers of this blog. I'm happy to announce that she'll be a guest on John's radio show on Saturday, July 25 at 10:20 PM Eastern Time. The Saturday show broadcasts from New York City's megawatt 77 WABC-AM, which can be picked up across a wide region in the Eastern USA (and even in parts of Canada), and which can be heard online nationally and globally. A podcast of the interview will be available the next day at the show's website. Although John's website hasn't announced this yet, 630 WMAL-AM out of Washington, DC, which airs a portion of John's Sunday show, has picked up the last three hours of the new four-hour Saturday Batchelor show. The WMAL Saturday broadcast starts at 10:00 PM Eastern Time, so Melissa's interview will be included. WMAL can be heard online, although I'm not sure of the internet range outside the Greater Washington, DC area, which includes parts of Virginia and Maryland. To the best of my knowledge the Saturday show has not been picked up by the California stations broadcasting the Sunday show although I hope that will change. See John's website for more information on the show and for the Saturday and Sunday schedules, which are generally available by Saturday. 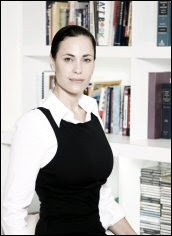 Melissa Mowbray-d'Arbela, an Australian based in Hong Kong, is the CEO and co-founder of Filligent, Ltd. From her interview in POWER magazine and her biographical sketch at Filligent she seems quite an extraordinary person -- a cross between an entrepreneur, humanitarian and innovator. "According to pandemic experts an effective face mask like the germ-killing BioMask could reduce the number of cases from one million to just six in the first months of a pandemic." But there's no other mask like BioMask™. It's made from a material that represents a biotechnology advance. 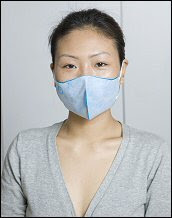 Typical face masks (including standard surgical masks and N95s) do not kill airborne pathogens. They are based on a passive mechanical filtration design only. Thus, microbes on or inside the mask can stay alive for many hours, greatly increasing the likelihood of cross-contamination. The BioMask™ traps and kills bacteria and viruses within seconds of their landing on the outer layer of the mask's surface. That solves the problem for people, especially children, who fiddle with their face masks all the time they're wearing them, thereby transferring germs to their hands. It's that kind of problem that's caused health experts to view surgical masks, even the N95 respirator-type ones, as little use in an epidemic. Another problem is that regular surgical masks are ill-fitting; they tend to gap at the sides, which means they don't contain sprays from sneezing and coughing. The BioMask™ is designed to be a good fit. As part of the CE testing process, the BioMask™ was sprayed with live aerosolized Influenza A virus equivalent to 50 times the amount contained in a normal sneeze. (The Mexican swine flu is a strain of the Influenza A virus.) More than 99.9% of the viruses were killed after less than one minute. Similar tests were conducted on other key pathogens, with similar results. When the BioMask™ was tested in terms of all the major routes of exposure, oral and dermal, it showed no harmful effects on humans. The BioMask™ has been tested for dermal biocompatibility following internationally recognized standards set out in ISO10933: Biological Evaluation of Medical Devices. Tests were conducted to evaluate cytotoxicity to cells, skin irritation on contact, and skin sensitization after repeated contact. No cytotoxicity, irritation or incidence of sensitization was observed. For those who're wondering -- yes, the BioMask™ germ-killing techonology, named BioFriend™, has other applications, which include an amazing 'dry' hand-washing cloth and a patch. See the Filligent website for more data on the BioMask™, the implications of which are mind-boggling. If the mask was widely used at the start of an outbreak of an airborne infectious disease for which no vaccine is available, it would greatly slow the rate of infection. In combination with other NPIs ("non-pharmacological interventions"), it would ward off a pandemic even before a vaccine was ready for use. I don't know; there's no obstacle from the Filligent end that I can see. According to their literature, the mask is "flat-packed and can be surge manufactured. We are working with retailers and humanitarian organizations to get the BioMask™ and our other anti-infective products out to people as soon as possible." I do know there hasn't been much publicity about the mask in the USA. To my knowledge no media outlet, beyond a few blogs and scientific and medical web sites, has reported on it. That situation will change on Saturday's John Batchelor show. Stay tuned. Reference my July 21 post Filligent's BioMask can stop a pandemic. It's now for sale in Hong Kong. So when can you buy it at your local drugstore? Without going into gory detail or flinging around blame, I'll just note that the original version of this post contained information that reflected, shall we say, a breakdown in communication regarding some information about the Filligent Europe company. Now to rescue what I can of the original version of this post. Don't be fooled by imitations; there is only one BioMask™, which as you can see is a trademarked name. Visit the Filligent Europe web site for information on ordering the BioMask/BioFriend products. And here's the link to the Filligent site. I note from their website that Filligent Europe is set up to accept small orders for the mask in addition to large ones. The company is also selling the "QuickCloth." How cool is this? > Save water! Save paper! BioFriend™ traps microbes by mimicking the sites on human cells to which they normally attach, then,destroys them by disrupting their surfaces (viruses) and cell walls (bacteria). Kills germs including the superbug MRSA plus those that cause gastroenteritis, herpes, Influenza A, Bird Flu, common colds, measles, SARS and tuberculosis. Hand wash only. Replace after one month of active use. Filligent Europe is offering other products based on the BioFriend technology. The QuickPatch looks interesting, especially for small children, who tend to lose things like cloths. I guess you just slap a couple patches on their arms or clothing when they go out, and they can rub their hands on the patch to clean them. But I love the thought of that hand cloth because I'm really tired of using the gel sanitizers. [...] 3M’s safety unit benefited from a “tremendous sequential surge” in demand for the masks last quarter because of the spread of H1N1, also known as swine flu, Chief Financial Officer Patrick Campbell said today on a conference call with analysts and investors. The investment will boost mask capacity worldwide by 10 percent." “We are going to have some sustainable growth that comes from H1N1,” Chief Executive Officer George Buckley said on the call. Demand for the protection is “huge,” he said. Masks to protect against the H1N1 influenza virus are on back-order through 2009, Buckley said. 3M and Kimberly-Clark Corp. are among the few manufacturers that make respiratory masks sophisticated enough to ward off swine flu, exacerbating shortages. Only masks rated N95 or above, which can filter at least 95 percent of airborne particles, are effective at blocking the virus, according to the U.S. Department of Health and Human Services. (July 24 Wall Street Journal) - Global health officials are scrambling to try to prevent the spread of the H1N1 swine flu virus, with U.S. officials moving Thursday with a recommendation that the Food and Drug Administration approve or license a vaccine. In the U.S., a federal advisory panel said the FDA should move ahead to approve or license the new H1N1 vaccine without waiting to receive data from clinical trials to test its safety and efficacy. The government and vaccine makers plan to start human studies of the H1N1 vaccine in the U.S. in the coming weeks, but the first-look data from those studies won't be given to the FDA until September. Each year the FDA approves seasonal vaccines based on strain changes without new human studies. The agency does test the vaccines for potency and also monitors vaccine safety on a continuous basis. "I think this is an entirely appropriate way of proceeding and in the public health's best interest considering that schools will be opening in a month," said John Modlin, the panel chair and a professor of pediatrics at Dartmouth-Hitchcock Medical Center. Health officials health officials said Thursday they have purchased enough bulk ingredients to produce 195 million doses of swine flu vaccine, and expect to make up to 100 million doses available in October, even though the vaccine is proving difficult to manufacture. Federal officials told the FDA panel Thursday that four companies making H1N1 vaccines -- Sanofi Aventis, Novartis AG, GlaxoSmithKline PLC and CSL Ltd. -- said the viruses used to make the active ingredient are producing yields of just 30% of what's typically seen with seasonal vaccines. The new H1N1 shots would be for a vaccination campaign that potentially would be targeted first at school-age children, who along with young adults have been hit hard by the new flu strain. A Centers for Disease Control and Prevention vaccine advisory panel will meet next week to make recommendations about such a vaccination campaign. Since May 23, when the U.S. government announced they'd contracted with three drug companies to make enough swine flu vaccine "to immunize at least 20 million people in key positions in health care, national security and emergency services," there has been one glitch after another in getting vaccine manufacturing up to speed. Last week an article by AP's medical reporter Mike Stobbe provided insight into one reason for the delay: before gearing up for swine flu production, the companies needed the U.S. government to indemnify them against lawsuits that might be filed because of side effects or death from the swine flu vaccine. Last month Department of Health and Human Services Secretary Kathleen Sebelius signed the document, which also indemnifies federal officials. And because people wouldn't be able to sue the companies for wrongful death or injury the government had to set up a fund to provide compensation. One can't blame the vaccine makers, who don't need to make influenza vaccines to turn a profit, for dragging their feet until they had some assurance they wouldn't be sued out of existence. The USA is a litigious society. But all this has cost precious time in the face of a pandemic. All that says nothing about other problems involved with swine flu vaccine development and distribution. Yesterday another ace medical reporter who's been closely tracking swine flu issues, Helen Branswell at the Canadian Press, took the bit between her teeth and gave the lay reader a summary of the most vexing problems that would be comprehensible to the layperson. The Effect Measure blog expanded on Banswell's report, again in a language that's accessible to the general reader. I'll let those two sources bring you up to speed on the vaccine problems. But the issues that have arisen with the vaccine and vaccination logistics point up the folly in assuming, this early in the virus' life, that a vaccine would be the magic bullet against a pandemic. As the assumption has crumpled the inadequacies of U.S. pandemic planning have become increasingly evident. One big problem is that the planning relied too much on pharmacological interventions (anti-virals and vaccines) and too little on NPIs (non-pharmacological interventions). Examples of NPIs are all those plodding things China's government has insisted on doing; e.g., quarantine, rigorous 'social distancing' measures, careful monitoring of arriving international air passengers for a temperature, etc. On Sunday Effect Measure took up the gloomy theme of pandemic unreadiness in the USA, which I've been pounding away at for months on this blog. I don't agree with the author's speculation that today's pandemic won't rend the social fabric in the USA any more than it did during the 1918 pandemic, but I found the rest of the observations worthy of note. As early as mid-May USA Today also took up the unreadiness theme with a report bluntly headlined, USA ill-equipped for a swine flu pandemic, experts fear. Curiously, or perhaps not, much of the article is given over to officials congratulating themselves on how well they've done to prepare for pandemic but as the article winds on it's clear that the readiness is relative; there was no readiness at the time of the SARS outbreak, so yes relatively speaking there has been improvement in pandemic readiness. I'm afraid that's not saying much in the face of the real McCoy. It's like having only half a tornado cellar built when the funnel cloud appears on the horizon. So here we are today, with not much more than Tamiflu and Sesame Street's instructions on how to sneeze and wash our hands properly, as our bulwark against a pandemic's onslaught. And with the start of the school year six weeks away -- five weeks, in some regions of the USA. The really bad news is that swine flu didn't perform to the experts' expectations and leave the Northern Hemisphere at the end of the annual influenza season. We may not see the full implications of this until schools re-open in September. The vaccination program for public school students is always at the start of the school year, before flu season begins. So how this situation is going to be impacted, if this year schools are hit with a flu epidemic as soon as they open, is probably another question public health and school officials are wrestling with right now. With all the above in mind, the rest of this writing is to tell you about a remarkable invention called the BioMask™, which is made by a company called Filligent. My description of the mask is based on the one posted at Science Blogging 2.0, which draws on Filligent's literature about the mask. But there's no other mask like BioMask™ (right), which is made with a material that represents a biotechnology advance. The mask is lightweight, comfortable, highly 'breathable,' perfectly fitting, moisture and mold resistant, inexpensive, safe for humans, non-irritating to skin, and as attractive as a face mask can be. For those who're wondering -- yes, the BioMask™ germ-killing material, named BioFriend™, has other applications, which include disposable facial tissues. The implications of the filtration mask are so vast that I'm still having a hard time wrapping my mind around them. If the mask was widely used at the start of an outbreak of an airborne infectious disease for which no vaccine is available, it would greatly slow the rate of infection. In combination with other NPIs, it would ward off a pandemic even before a vaccine was developed. Then why, given the mask's availability since April, isn't it sold at retail outlets in every country including here in the USA? I do know there hasn't been much publicity about the mask in the USA. To my knowledge no media outlet, beyond a few blogs and scientific and medical web sites has reported on it. I learned about the mask from following a link at the Snowy Owl medicine man blog at Daily Kos that led to a link at the Chen Qi pandemic news blog. A June 12 press release from Filligent mentioned there was interest in the mask in Australia. But right now the only place on the planet you can buy the BioMask™ retail is Hong Kong, where it became available July 7 at Asia's leading drugstore chain, Watsons. Hong Kong’s biggest travel agency, Hong Thai, will be providing the BioMask™, on a complimentary basis, to all air travelers through the end of August. Up until now, the CE-certified, specialist mask has only been available to medical and healthcare professionals. Mowbray-d'Arbela (left), an Australian based in Hong Kong, is a co-founder of Filligent. From her interview in POWER magazine and her biographical sketch at Filligent she seems quite an extraordinary person -- a cross between an entrepreneur, humanitarian and innovator. While we're waiting for government to get everyone to stop smoking, why not make a better cigarette filter, so smokers don't have to inhale 4,000 chemicals every time they take a puff? While we're waiting for government to end air pollution, why not take personal means to protect oneself from the worst effects of pollution? While we're waiting for government to distribute the perfectly-matched flu vaccine -- you get the picture. [...] Many parents were worried about outbreak-caused closures of schools or day care centers, with 43 percent saying they would lose pay or have money problems if they had to stay home a week or more because they were sick or had to care for someone. And I don't think it would take much coaxing to get children to wear the mask at school. My first sight of the BioMask™ photo above made me think of a ninja. It's a cool-looking mask, not like the weird, clunky N95 or the sloppy-looking, wrinkled affairs worn now by people trying to protect themselves against swine flu. And children are practical; I think they'd understand the need for the mask at school, and that they'd rather enjoy the thought of wearing a contraption that zaps germs. So I'd urge my fellow Americans to encourage your local pharmacy, and school and public health officials, to stock up on the BioMask™. And if the mask requires FDA approval before it can be used in the USA, I’d hope Congress, DHHS, and Homeland would encourage the agency to fast-track approval. Meanwhile today it was revealed that security teams will be drafted in to guard supplies of swine flu drug Tamiflu. The ring of steel will be put up outside distribution centres to stop thefts and protect staff from desperate patients. More than 100 centres will be set up at pharmacies and clinics across London. Police have been involved in drawing up plans for the centres whose locations have been kept secret. Reference my comments below about the Tamiflu honor system. Sir Liam really, really needs to re-think the phone-in system. NO SMIRKING WARNING: So how's your government's pandemic planning coming along? Sir Liam Donaldson, the U.K.'s chief medical officer, got the weekend off to a roaring start by ordering the country's National Health Service to prepare for 65,000 deaths in the U.K. in the next few months with a death toll at 350/day at the pandemic's peak this winter. Is the British government blowing the situation out of proportion? About two weeks ago, when Health Secretary Andy Burnham was quoting mathematical projections that 40 Britons could die every day from swine flu, maybe the answer would have been yes. At that time the government was trying to turn on a dime: go from assuring the public that swine flu was nothing to worry about to preparing the public for what might have to be a mandatory vaccination program. Today, studying the outbreak pattern in England, I'm afraid I've had cause to remember my May warning that highly populated island nations are a sitting duck during a pandemic. Sir Liam revealed that there are 652 swine flu victims in hospital in England, 53 in intensive care. In the last week alone, there have been 55,000 new cases of flu-type illness - more than twice the figure for last week. All areas, except Yorkshire, are experiencing 'exceptional' numbers of cases and there are ten local hot-spots, mostly in London. It means the swine flu outbreak, still only in its early stages, is already worse than last year's winter flu, which was itself the biggest outbreak for nine years. In one planning assumption the death rate would be 0.1 per cent of those who catch swine flu. In the worst-case scenario it would be 0.35 per cent. Assuming 30 per cent of the population get the disease, there could be up to 65,000 deaths. This compares with 6,000 from normal seasonal flu and 21,000 in the last flu epidemic in the winter of 1999/2000. A death toll of 65,000 would be double the number who died during the pandemics of 1957/8 and 1968/9. It would make the outbreak the worst since the Spanish flu of 1918/19, which killed hundreds of thousands in the UK. John Oxford, virologist at Barts Hospital in London, said last night: 'It's fair for the NHS to put these assumptions on the table, but I would predict that the number of deaths will be much, much lower - at the bottom end of their scale. It's those "hot spots" or cluster outbreaks, as they're also called, which could be reflecting exponential spread of the infections. To relieve what he called the 'enormous' pressure on the NHS, Sir Liam announced that a phone and internet service would start from the end of next week, allowing people to get Tamiflu without seeing their GP. The National Flu Pandemic Service will operate from a series of call centres manned by 2,000 staff from agencies, most of whom are expected to be students and temps. People will be able to ring a single number - to be released shortly - if they believe they have swine flu. Operators will ask a range of questions and, if the answers suggest the person may have swine flu, they can prescribe Tamiflu. At present, people who ring NHS Direct still have to call their GP to get the drug. The Department of Health confirmed that call centre staff would not be medically qualified, but said they would receive training on symptoms and there would be medically-trained people on site. From next week, patients will also be able to get Tamiflu prescriptions over the internet. Those prescribed Tamiflu through the new service will be told to stay at home and nominate a 'flu friend' to pick up the drugs from local depots. The new flu line will initially be available only in England. The aim is to take the pressure off family doctors, who will be dealing with the most serious cases. Critics fear the scheme will give the 'worried well' access to Tamiflu even if they do not need it - depleting the NHS stockpile. But Sir Liam said he was trusting people not to abuse it. Ministers have been stung by accusations they were too slow to respond to previous crises such as foot and mouth. The Worried Well are not the biggest problem. It won't take Pakistani dope dealers in the U.K. even four minutes to figure how to rip off the phone-in system and sell Tamiflu on black markets in poor nations. That's because the black-market distribution networks are already in place, stretching from their end of the AF/PAK heroin pipeline throughout Asia and the Middle East. And it won't just be Pakistanis; every crook in the U.K. who's plugged into a 'black' or deviant globalized business network will have gang members, friends and relatives snuffling to the phone-in line that they're deathly ill, and describing their swine flu symptoms. I give the phone-in system three weeks before the locusts pick the national stockpile of Tamiflu clean. The phone-in scheme and Sir Liam's talk about an honor system ignore the realities for people in poorer countries, who are already scrambling to obtain Tamiflu. Supplies are very tight in many countries. I interject that I'm not going to sit here day after day and give the same warning to Sir Liam. But within hours of my admonishment that he shouldn't say in public that the British were at the front of the swine-flu vaccine queue, his comments set off an international row. WHO's Margaret Chan accused the Western nations of hogging all the vaccine. Just a few days ago an Indian hospital ran of out Tamiflu when panicked Google employees who'd been exposed to swine flu at the office descended to demand Tamiflu. There weren't enough capsules to go around and with no means to quickly test every employee for the disease, the doctors were only giving out enough Tamiflu for prophylactic doses, and only for a couple days -- not long enough to stave off swine flu. And the lower prophylactic dose is an engraved invitation to swine flu to mutate into another Tamiflu-resistant strain if the person is already infected, beep this is a recording. Say, why not try a pandemic-fighting strategy that works? And that is another problem with the phone-in system described by Sir Liam. Tamiflu is most effective if administered within six hours of onset of symptoms; after 48 hours of the infection the medication is no longer effective. There was a news report over the weekend that thermometers had been cleaned off the store shelves in the U.K. I assume, I hope, the situation will be quickly rectified. But if people dose themselves at the wrong time with the Tamiflu they've obtained from the phone-in system they're not only wasting Tamiflu, they're also risking not having the stuff on hand if they really do become ill with the virus. So I would advise that the ministers spend a little less time trying put on a show of activity, and invest more time in thinking. Stop and consider: Mexico's President Felipe Calderón broke the back of the swine flu outbreak in Mexico City by declaring a five-day government holiday in the city and asking city businesses to close shop during the period. This fact is so well known that I won't even take time to find a news link to support my statement. But a few weeks ago, at the swine flu summit in Cancun, Calderón was practically pinned with a medal for his quick thinking and bold action to fight swine flu in Mexico City. The holiday, which he created by extending the regular weekend and Cinco de Mayo holiday by two extra days, rendered Mexico City a ghost town for five days. And it cost Mexico millions USD if not billions. But by gum it stopped the spread of the virus in one of the world's most populous cities. This being the Novel 2009 Swine Flu Virus we're talking about, of course the little anarchist only laid low. Then it popped up again -- in two rural areas of Mexico, if recall. I haven't had time to keep up on the outbreak in Mexico so I don't know how Calderón responded to that theater of war opening up. And probably the virus eventually popped up again in Mexico City. But the wholesale 'social distancing' created by the holiday threw a lot of sand in the virus's gears. And slowing down the rate of infections is the name of the game for pandemic fighters beep this is a recording. As for what a swine flu holiday would cost the British economy -- how much money are they going to be losing if only part of Sir Liam's worst-case scenario comes about? Shut down the cluster outbreaks in London by declaring a holiday, at least in London. And once you isolate the outbreaks, that's where you plug in the Tamiflu. And you're really going to slow the virus if you combine a five-seven day holiday with quarantine of cluster outbreaks, although I might be dreaming if I think the Labor government would follow advice to quarantine. However, they've just got to bash the infection outbreaks back over the line long enough for a vaccine to be administered and take effect. Yet surely the government realizes at this point that their vaccination program is running into snags that could delay it by several weeks or even months. So don't base planning on an assumption the vaccination program will be in high gear by the end of August. Lab workers are harvesting one dose or less of the component they need from each egg in which the virus is grown, said Eric Althoff, a spokesman for the Swiss drugmaker. That’s between a third and half of the typical yield for a seasonal flu vaccine, he said. The low yield may slow production of a pandemic vaccine because it means drug makers like Novartis, Baxter International Inc., Sanofi-Aventis SA and GlaxoSmithKline Plc can extract less of the protective ingredient from each egg. Baxter’s Chief Executive Officer Robert Parkinson and a spokesman for Sanofi also said yesterday the amount of swine flu virus growing in each egg is lower than for seasonal flu. What happened to Novartis' super-duper cutting edge cell technology, which made culturing the vaccine in eggs unnecessary? "The speed advantages of our cell-based production approach and our unwavering commitment to address this public health emergency have resulted in our ability to provide the fastest possible response to this outbreak," said Dr. Andrin Oswald, CEO of Novartis Vaccines and Diagnostics. "This achievement is also a testament to the technical skills and innovation of Novartis Vaccines and Diagnostics people and our partners. I believe it highlights our reputation as a leader in influenza vaccine research, development and production." The first swine flu vaccine will be given to the public before full clinical data about its safety is available, it has been revealed. The first samples of the pandemic vaccine will arrive at the end of this month and a decision whether to approve it would then be taken within five days. But a spokesman for the European Medicines Agency has confirmed that no clinical trial data from human volunteers on the vaccines will be available until September at the earliest. [I]n Britain it was being reported that pregnant women are to be given advice to avoid travelling on trains and stay away from crowds. Parents would also be advised to keep babies away from crowds and to limit the movements of their other children to stop them bringing the virus home. The advice was based on a joint statement from the Royal College of Obstetricians and Gynaecologists and the Royal College of Midwives. However, last night the Department of Health said it was not issuing any such warnings, despite predicting last week that thousands more fatalities were expected after the UK death toll reached 29. In another development, the National Childbirth Trust was accused of scaremongering by the Royal College of General Practitioners after reportedly advising women to consider postponing becoming pregnant. Doctors want guards on the doors of hospitals and intensive care units in case the families of swine flu victims become violent if they are refused treatment. There is already a chronic shortage of intensive-care beds, particularly for children, across the country. But doctors anticipate that demand could soon exceed capacity as the number of serious cases of swine flu rises. Bruce Taylor of the Intensive Care Society - which represents ICU staff - said: ‘Violence from patients’ families is on a list of things that staff might have to worry about as this pandemic progresses. A spokeswoman for the Department of Health said: ‘Decisions on whether this is necessary should be taken locally. As many as one in five people could be off work because of swine flu within a fortnight. Experts yesterday predicted up to 20 per cent of the 29 million workforce could take time off because they are ill or have to care for relatives who have been struck down. The under-30s are most likely to be affected because figures show they are the ones taking most time off with flu-like symptoms. The Health Department said last week that one person in eight could be off work with swine flu in a worst-case scenario. However, absence management specialist FirstCare, which provides its data to the Government, says the situation is escalating more rapidly than anticipated. It says in the past few days the number off sick with flu-like symptoms, coughs and colds has leapt from around one in 630 to one in 200. That rises to one in 150 when taking into account staff forced to look after sick relatives. If the rate of absence continues at the same pace, one in five will be staying at home by the start of August. The Federation of Small Businesses said such a scenario would be ‘devastating’ and could cost the economy around £1.2 billion a day. Now wouldn't it have been simpler to do as the Chinese did and stage the first line of defense at U.K. international airports? Not that I enjoy pounding away, day after day, at the same point. But what WHO termed China's "resource intensive" swine-flu fighting method is looking more cost effective by the hour, isn't it? (UKPA - late Sunday night) - Health Secretary Andy Burnham is to update MPs on swine flu following a weekend of confusing signals over advice for high-risk groups. In a statement to the Commons before Parliament rises for the summer recess, he is expected to provide the latest information on the outbreak ahead of the launch of a new flu hotline at the end of the week. See RBO blog's Swine Flu Reader for all my previous posts on swine flu, which are also published at RBO. The recent posts provide additional information about the swine flu outbreak in the U.K. and the government's approach to handling it. Jakarta terror bombings cast a pall over Hillary Clinton's arrival in India. The question is whether this was intentional. When I turned on the TV around 12:45 ET Friday morning Fox News Cable was bedded down for the night, airing a re-run of the Sean Hannity show, but CNN was roaring along with live coverage of the Jakarta bombings. CNN scared up for comment Rohan Gunaratna, ace international terrorism analyst and counter-terrorism strategist. He probably knows more about the Indonesia-based terror organization Jemaah Islamiah than most government intelligence agencies. Rohan said straight off the bat that the bombings of the two Jakarta hotels were the work of JI. Hours later Reuters reported that police investigators had noted the bombs were packed with nails, ballbearings, nuts and bolts to maximize the carnage and appeared to be "identical" to ones previously used in JI attacks. I can't recall whether Rohan also said that the terror strike was done with al Qaeda's help but he probably did, or wouldn't disagree with the observation. The precision of the dual operation and Qaeda's signature one-two punch makes it beyond question that U.S. intelligence advisors are dreaming if they think strong ties were ever severed between JI and AQ. The government needs to target infrastructures that support the cells, even though government did a good job targeting cells. I'm still seeing that fundraising to support JI is quite open. I'm still seeing that radical terrorists who preach violence against government and the West do so openly. The government needs to act to dismantle those structures. CNN also spoke with one observer in Indonesia who opined it was likely 'Westerners' were specifically targeted in the attacks. (Of course this would include people who come from 'Western-style' nations, such as Australia and New Zealand, no matter where the nations are located. He said restaurants and lounges in the targeted luxury hotels would have been full at that hour with 'Western' tourists and with Indonesian businessmen having breakfast meetings there, but because it was Friday morning "observant" Muslims would have been at mosque prayers. When CNN asked Guanaratna what he thought of the theory he replied that it sounded plausible but the key determinant for any JI operation was that the timing of an attack assured its success. He went on to stress this point, saying in so many words that the top consideration for choice of date and time of the bombings was simply that they were the best opportunity for JI to strike. From this, it's possible that JI had wanted to attack even earlier, perhaps timed for U.S. Secretary of State Hillary Clinton's mid-February visit to the country or Indonesia's President Susilo Bambang Yudhoyono's reelection campaign and/or landslide political victory on July 8. That she and her entourage were slated to stay at a site of the terrorist-instigated Mumbai massacre last year -- the Taj Mahal Palace & Tower, another luxury hotel that attracts Western tourists and India's elite -- would have been easily discovered by al Qaeda's spies in India. Another great counter-terrorism expert, India's B. Raman, noted on his blog yesterday that the Jakarta bombings of the JW Marriott and Ritz Carlton could be seen as part of a larger pattern of terrorist attacks on American and Jewish-owned luxury hotels in foreign countries that cater to well-off tourists and the local elite. [...] The Marriott hotels in different cities suffered from terrorist attacks in seven incidents--- New York, Jakarta twice, Islamabad thrice and Karachi once. Yet with all that said, we return to the inescapable fact that the Jakarta hotel bombings occurred while the U.S. Secretary of State was enroute to India, in what would be the first visit to the country by a high-ranking member of the new Obama administration. And where she was expected to make an extensive outreach to India's business leaders on behalf of America's government and business community. Clinton's first meeting in India was to breakfast this morning at the Taj with 10 of India's top corporation heads. Mumbai and all major cities in India would be a very hard target for al Qaeda and their affiliates at this time because security in the country, high since the Mumbai massacre, is ratcheted to the highest degree for Clinton's visit. This would be the same for India's luxury hotels. All the major hotels in Jakarta have security checks outside to reduce the risk of car bombs, although checks in many are not particularly thorough, with a security guard just poking his head in the window to look at who is inside the car. While details are still sketchy on the bombing operation, the combination of more relaxed security measures and the strategy of building at least one bomb inside a target hotel, which makes it easier to avoid checkpoints, suggests that JI had a little elbow room in which to maneuver the timing of their attacks. From John's post about the Jakarta bombings he clearly believes they were al Qaeda's retort to President Obama's gauzy June speech to the 'Muslim World' and patronizing patronizing view of Islamist terrorism. But again, there is the simple reality of when the retort came. Apologies for my arithmetic; I was following breaking news at CNN on the Jakarta bombings while writing this. (Question to Fox Cable News: Do you have a breaking-news desk?) The Saturday show will of course be four hours, not three. And see RBO's article, published today, for plentiful background on John's show. The New York Daily News reported yesterday that starting July 18 New York City's 77 WABC-AM radio station will be airing a four-hour John Batchelor Show on Saturday in addition to John's Sunday show. Saturday airtime: 9 PM to 1 AM Eastern Time. WABC can be heard nationally and globally online here. For more information on the show see the website. First Andy Burnham, the health minister, newly installed in his job on June 5, reportedly assured Britons on June 12 that swine flu was nothing to worry about, and on June 30 remarked, "The risk to the general public remains low and we can all play our part in slowing the spread of the virus by following simple hygiene procedures – like washing your hands and using tissues when coughing or sneezing." Two days later Burnham set off a panic in Britain and made himself a laughing stock among mathematicians by announcing that according to projections 100,000 Britons a day could be infected with swine flu and 40 could be dying every day by the end of August. Not satisfied with the health ministry's handiwork, Dr Peter Holden, who played a key role in drawing up the government's contingency planning for a pandemic, announced on July 11 that routine surgical operations and preventive treatment would have to take second place to swine flu treatment. By that evening, I suppose, the government had noticed that the masses were worried about dying at the rate of 40 a day from swine flu and being deprived of medical treatment for ailments other than flu. And with two leaked government memos in mind -- one that explained Scots wouldn't see a swine flu vaccine for another 16 months, another that complained the National Health Service was in a muddle about emergency swine flu planning -- they made an executive decision. Thus, on June 12, the (London) Sunday Times chirped that swine flu vaccine was due to arrive in Britain in a few weeks and that regulators said it could be approved for use in just five days. I don't think the assurance had quite the intended effect because the Times didn't know when to shut up. Instead, they got way too technical and explained that the vaccine would be fast-tracked through clinical trials. However, the Times, and the British government, tended to overlook that they were not talking inside a sealed room in the year 1902. In other words WHO officials in Switzerland immediately heard about the announcement. Chan told the [U.K.] Guardian newspaper that a vaccine would not be available for several months, despite statements from health officials in Britain that the first stocks would start arriving in August. "There's no vaccine. One should be available soon, in August. But having a vaccine available is not the same as having a vaccine that has proven safe," Chan said. "Clinical trial data will not be available for another two to three months," she added. Chief Medical Officer Sir Liam Donaldson, seeking to calm fears of more deaths from the H1N1 virus, hit back at claims by Dr Margaret Chan of the World Health Organisation that the drug could be delayed. [...] Sir Liam said: "She may be commenting from a global perspective, but as far as the UK is concerned, we are still expecting 60 million doses by the end of the calendar year. "There is some uncertainty because vaccine manufacture involves a complex process of testing biological products, so it can sometimes go wrong and cause delays. "We then have to license it properly and it may take a little time, but we still will be one of the first countries to get it." The Government also said the 60 million vaccines would be enough to cover half the population - with each person needing two doses - with the rest of the delivery following next year. Delays could result between manufacturers Baxter and GlaxoSmithKline delivering the supplies and people receiving vaccinations because the drug has to be approved by two agencies beforehand. This process can take months but the Government insisted last week the drug could be fast-tracked for use in Britain within five days. The Department of Health said yesterday: "The manufacturers have told us they will be delivering the first supplies of the vaccine at the end of August. This is not the Department of Health's schedule - it's the manufacturers. These contracts were set up some time ago to ensure we are first in the queue." Around 40,000 people a week are now contacting their GP over fears they have swine flu. The figures, from the Royal College of GPs, show a 50% leap in the past seven days. "It may take a little time but we will still be one of the first to get a vaccine," [said] Sir Liam Donaldson. If you ask, 'Isn't he actually saying the same thing that Margaret Chan said?' -- if you go over both statements with a fine tooth comb, then, if he'd just stuck to replying to Chan, yes, he said essentially the same thing. But he didn't stop there. So imagine you're sitting at a computer terminal in Nairobi or Dhaka, both of which will be lucky to see any swine flu vaccine by 2012, and reading that once again the British are doing everything to be first in a queue. Meanwhile, Margaret Chan is going around hat in hand, as it were, trying to wheedle a few million free doses out of vaccine manufacturers for countries that couldn't buy their way to the front of the swine flu vaccine distribution line. In their rush to assure voters that the United Kingdom would get all the vaccine its citizens needed, Gordon Brown's administration forgot that Donaldson's words would be posted on the internet within seconds of their publication. The British government doesn't need lessons in propaganda basics -- Say as little as possible, Say it as vaguely as possible, Don't nail yourself down to a date -- but politics has overtaken common sense. I understand the Labor party is on shaky ground right now, but what bothers me about all this, aside from the fact that I and my readers have more important things to do than watch a three-ring circus, is that Brown will most probably act to true to form. This means he might try to pressure President Obama to get Congress to authorize a huge donation of vaccine to WHO and other international organizations for distribution in the poorer countries. I hope my imagination has not run away with me. But being the nervous imaginative type, I have a few words for Britain's government: First you did too little. Then you talked too much. Don't try to use swine flu as a bludgeon against the United States in order to cover up your mistakes. My government has enough of its own mistakes to deal with on the swine flu front. And the United States has already agreed to donate 420,000 treatment courses of Tamiflu to help treat severe cases of influenza in Latin America and the Caribbean. In 2009, because of globalisation and the huge amount of international travel, the virus is taking six weeks to spread," says Dr. Somchai of the WHO. "In previous pandemics, it took six months to spread." According to another report it took the 1918 pandemic virus only four months to make its first pass around the globe. And it could be that the 2009 swine flu made its first round-trip in less than a month. But I won't quibble with Somchai because his point holds true -- although it would have been helpful if he'd made the remark earlier. Instead, he waited all this time to inform the public about what's been plain as day to swine flu watchers since May. Speaking of influenza and air travel, the import of the following news item needs no explanation for readers who've been following my posts on swine flu since April. For those just tuning into the swine flu story I'm afraid you have a lot of catching up to do. For now I'll just say that for months I've argued that the biggest obstacle to fighting a pandemic has been blanket institutional bias against staging a defense against the swine flu virus at the international airports. There is by now a huge body of evidence to back up my argument, yet the biomedical and public health establishments continue to ignore it. They continue to claim that because you can't 'stop' the virus after it's entered a country, it's no use trying to slow down the infections that come through the international airports. And when I repeatedly pointed out that China's astoundingly successful swine-flu fighting policy stages its first line of defense at its international airports, I was met with silence or the reply that China's government was lying about their number of confirmed swine flu cases. BANGKOK, Jul 15 (IPS) - [...] With over 4,000 reported cases, [Thailand] remains the worst hit by the [swine flu] pandemic in Asia. This week, the Bangkok Metropolitan Authority shut down 435 public schools, 200 nurseries and 13 occupational training centres. These centres of learning will remain shut for five days. The concern about the H1N1 pandemic spreading across this South-east Asian country of 65 million people is understandable. In mid-May, when Thailand hosted a meeting of the region’s health ministers to draft measures to deal with the new virus, there were no reported cases here. The only four cases in Asia at the time were in South Korea and Hong Kong, with three cases being reported in the former. Currently, 24 people have died out of the over 4,000 confirmed cases of the type-A H1N1 virus, according to public health authorities. That works out to a 0.4 percent fatality rate, or four deaths out of 1,000 infected patients, which places it at a manageable Level Two, according to World Health Organisation (WHO) calculations. Countries are expected to shut their borders if the virus hits Level Five. China, the regional giant, by contrast, had reported over 2,000 cases by the first week of this month [China's first confirmed case in Hong Kong was reported May 4; the Mainland's first case was reported May 11]. Japan had reported 1,790 cases, Philippines reported 1,709 cases, and Singapore reported 1055 cases, up to that period, according to the WHO. In order to deal with the virus spreading further in Thailand, public health experts are prescribing measures that seek to slow the spread of the virus, rather than trying to stop it infecting people. "This is not the time to contain the virus. All the effort should go to mitigation," says Dr. Somchai Peerapakorn, of the WHO’s Thailand country office. "Now you cannot stop the virus. We have to slow down the spread by protecting the population." "This is a brand new virus. Nobody can say what will happen next," he explained in an interview. "Measures to deal with the virus should be proportional and rational according to each country’s situation." The profile of those infected by H1N1 provides pointers to help shape mitigation efforts. "The picture of those infected here are pretty much the same as those infected internationally. They are children, young adults and working age people," says Dr. Supamit Chunsuttiwat, a specialist in preventive medicine at Thailand’s public health ministry. Yet what remains uncertain for now in a country that has impressive public health facilities when set against its poorer neighbours such as Burma, Cambodia and Laos is the exact number of H1N1 cases. "The number of real cases may be much higher," Dr. Supamit told IPS. That stems from the country being among the most open in the region, welcoming a steady flow of tourists, a factor that has made Thailand more vulnerable to the virus than those with less airline passenger traffic. "The spread of the virus is because of our exposure," says Dr. Supamit. "We welcome so many tourists. Smaller countries with less exposure to tourists are having a less impact." Thailand’s challenge to slow the spread of H1N1 comes at a time when the WHO confirmed on Monday that the new flu is "unstoppable" and recommended that all countries seek "access to vaccines." The speed at which the virus has spread from one corner of the globe to Thailand, on the other side, points to a new reality. "In 2009, because of globalisation and the huge amount of international travel, the virus is taking six weeks to spread," says Dr. Somchai of the WHO. "In previous pandemics, it took six months to spread." H1N1/swine flu: Lies, damned lies, and mathematical modeling. Will wonders never cease? Everyone and his uncle in the press have picked up on the importance of the story that Reuters' Maggie Fox reported on yesterday and the Imperial College study she mentioned. See my July 14 post, How widespread is swine flu? Without accurate numbers, who knows?. Welcome to the data-discussion party, ladies and gentlemen of the press; it's only been roaring along since May. There you go; that's coming right out and saying it in plain English. More accurate ways of measuring mortality from swine flu are needed to help health officials to make the right decisions about managing the pandemic, scientists said yesterday. Standard methods of calculating death and hospital admission rates for the influenza A (H1N1) virus are unreliable and can both underestimate and overestimate the true figures, according to research at Imperial College, London. One of the key measures of the virulence of any disease is its case fatality rate (CFR), which is generally calculated by dividing the total number of known cases by the total number of deaths. A good estimate of the CFR for swine flu, and of its hospital admission rate, is needed to help healthcare planners to decide on appropriate measures for containing infection, such as school closures, and on vaccination strategies. It's nice to learn that the biomedical and public health communities have decided to explain to the public that there are serious problems with data collection and mathematical modeling on swine flu. But it was only a matter of time before studies such as the Imperial College one would be in the works. So attempts by governments to hide their poor pandemic planning behind crummy data collection and bad math were bound to be exposed. A vaccine to contend with the mounting swine flu pandemic is not going to be readily available for months as the death toll from the virus increases, according to a statement made by the world's top health official on Wednesday. World Health Organization chief Margaret Chan made the comments after Australia and Japan reported a surge in cases of the A(H1N1) virus, and Argentina experienced a sharp increase in the number of deaths from 94 to 137 in just three days. "There's no vaccine. One should be available soon, in August. But having a vaccine available is not the same as having a vaccine that has proven safe," Chan told Britain's Guardian newspaper. The swine flu viruses currently being used to develop a vaccine do not contain enough of the ingredient needed for the vaccine, therefore WHO has requested that its laboratory network produce a new set of viruses as soon as possible. Countering health officials in Britain and elsewhere who claimed the first stocks would start arriving in August, she added "clinical trial data will not be available for another two to three months." And I am under the impression that it takes about six weeks for a flu vaccination to become fully effective -- to the extent it can be, if it's well matched to the influenza bug. "In view of the anticipated limited vaccine availability at global level and the potential need to protect against "drifted" strains of virus, SAGE recommended that promoting production and use of vaccines such as those that are formulated with oil-in-water adjuvants and live attenuated influenza vaccines was important." "SAGE" is the acronym for WHO's hilariously named advisory panel on immunization, "Strategic Advisory Group of Experts." OOC -- Oligarchs of Chaos -- might be more descriptive. [...] [Dr. Marie-Paule Kieny, WHO director of the Initiative for Vaccine Research] said WHO would also work to get better viruses for companies from which to make vaccines. She said the strains that had been distributed did not grow very well in chicken eggs -- used to make all flu vaccines. As to whether a live-virus vaccine would require more testing than a killed-virus one -- you can forward your technical questions to MedImmune, which has picked up $61 million to produce a swine flu spray. But from my informal survey of one reader who studies these kind of questions: "Yes, the live vaccines give better immunity, if they don't kill you." They gambled that the swine flu virus acted pretty much in the same way as the seasonal influenzas. It doesn't. And they gambled that an adequately tested killed-virus vaccine could roll off the assembly line by September at latest. Unlikely, which leaves humanity pinning its hopes on a live vaccine. From now on, the public health community might want to confine their gambling to the roulette table. But has anyone considered eating a little humble pie and asking China's Ministry of Health how their vaccine manufacturers are planning to pull off a miracle? They're supposed to have a safe vaccine ready in time for the MOH's target September 14 date to begin China's swine flu immunizations. Maybe they were overly optimistic about the target date. Maybe they were always going for a live-vaccine spray. But I have no idea what they're doing and neither will you, unless you swallow your pride and ask. Wake up.